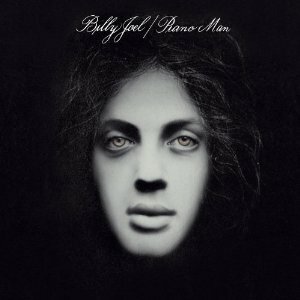 The first minute and a half of Billy Joel’s sophomore album is tremendously revealing, and also a little bit deceiving. The most obvious development in that opening minute and a half is Joel’s tremendously colorful sound provided by a diverse instrumentation. Where Cold Spring Harbor relied almost entirely on piano and vocals, Piano Man has a vivid soundscape that includes numerous string and wind instruments along with a wider variety of percussion and a distinct bass line. The next most obvious development in those ninety seconds is a looser, more creative structure; Travelin’ Prayer, the opening track, is a refrain-less beat poem. While Cold Spring Harbor had flirtations with unusual structure (the strange middle verse of Tomorrow Is Today, for example), the songs largely fit a uniform mold that is often absent on Piano Man. We also learn quickly that Piano Man is a west coast album, not an east coast one. Joel moved to Los Angeles in 1972 after Cold Spring Harbor floundered commercially, and the western influences are obvious. Elton John’s The Tumbleweed Connection is clearly a key inspiration. From the start of Piano Man, Billy Joel simply sounds more confident, polished, and professional. No longer do these performances feel like rough drafts. He hadn’t yet reached his peak, but every composition and rendition is adequate at worst, which couldn’t be said of Joel’s debut. While these first impressions all accurately reflect the evolution in Joel’s career found on Piano Man, that first minute and a half also gives one inaccurate impression: That Piano Man is a sentimental and loving album. It definitely isn’t. That’s not to say Piano Man is entirely cold. In fact, I divide the album thematically into half. Five of the ten tracks here — Travelin’ Prayer, Piano Man, You’re My Home, The Ballad of Billy the Kid, Worse Comes to Worst — showcase Joel’s warm, humane side. The other half, though, showcases Joel at his darkest. He chronicles all sorts of emotional despair and broken relationships. A recurring theme is the inevitability of solitude and suffering. The bleakest moment is the seven-minute Captain Jack, which depicts the two-headed beast of addiction and nihilism and how they can lead to a pretty crappy young adulthood. If this sounds grim, it’s because it is; Joel so casually tosses out revelations like “They just found your father [dead] in the swimming pool” and “You can’t understand why your world is so dead,” that the song can be a tough listen. But in the correct live setting, the song is something of a masterpiece that plumbs and purges the darkest depths of Joel’s soul. It never has a redemptive moment, but its organ-backed chorus is so intensely cathartic that it is somewhat therapeutic. There are a few other dark moments. For example, Somewhere Along the Line posits that everything nice and enjoyable will eventually go sour, and If I Only Had the Words laments that romance is kind of pointless anyways. Also on the bleak end of the spectrum are Stop in Nevada and Ain’t No Crime, which cover breakups from two perspectives. Stop In Nevada lambasts a leaving lover even as it can’t really blame her for doing so (“And though she finds it hard to leave him / She knows it would be worse to stay”). Ain’t No Crime, meanwhile, takes pity on the bum who gets left behind even as it smacks him around. Together, these five tracks paint a pretty dark picture of humans in general, and specifically men: They’re nothing but fleshy bags of impulses. It’s an emotional low-point for Joel, who must have been going through some heavy stuff at the time. Fortunately, there’s a flip-side of the coin to all this pessimism and desolation. The other half of the album, which is more structurally ambitious and weighted towards the front of the album, takes a slightly more positive light on humanity. Travelin’ Prayer, whose opening I’ve described, provides a good lens to some of the musical themes on the album. It’s very bluegrass-tinged both in the lyrics and the music, which makes it something oddity in Joel’s oeuvre. Joel self-mythologizes on The Ballad of Billy the Kid, painting himself (presumably — he claims the song is actually about another Billy, though I doubt that’s entirely true) both a hero and a villain. It seems heavily inspired by Copland’s Hoedown and has some distinct classical elements to it. And so we come to the elephant that I’ve avoided thus far: Piano Man the album, ultimately, will always be remembered first and foremost for Piano Man the song. Certainly, Piano Man is one of Joel’s finest and most moving works. It more than overcomes a few bits of clunky writing — “tonic and gin” will never sound quite right, and God only knows what a “real estate novelist” is — with a series of heartbreaking portraits of lives that are sinking as the narrator’s music soars. It would be a mistake to overstate the prominence of the title track on Piano Man. Though it’s understandably Joel’s trademark song, it never overshadows the magnificent, vivid, aching album around it, one that’s just short of a masterpiece. This post is part of The Month of Billy Joel series.